Heat oven to 350°F (325°F for dark or nonstick pan). Spray bottom only of 9-inch square pan with cooking spray (without flour). In small bowl, beat filling ingredients with electric mixer on low speed until smooth; set aside. In medium bowl, stir brownie mix, butter and eggs until well blended (batter will be thick). Spread three-fourths of batter in pan. 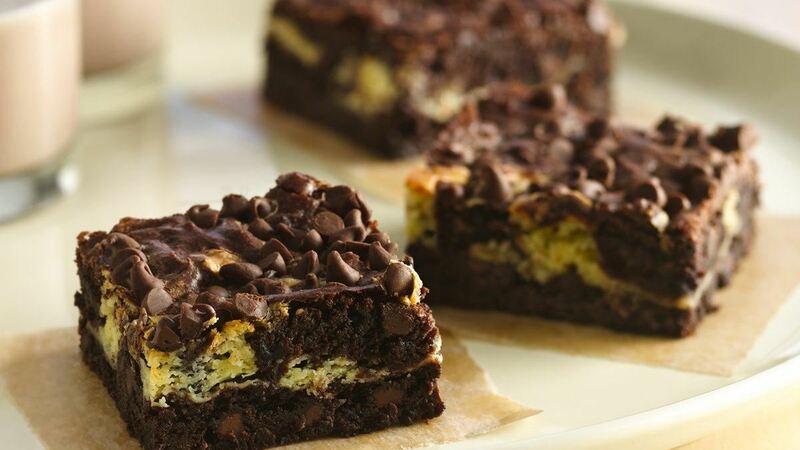 Spoon cream cheese filling by tablespoonfuls evenly onto brownie batter. Spoon remaining batter over filling. Cut through mixture with knife several times for marbled design. Sprinkle with chocolate chips. Bake 37 to 44 minutes or until toothpick inserted 2 inches from side of pan comes out almost clean. Cool completely in pan on cooling rack, about 1 hour 30 minutes. Cut into 4 rows by 4 rows. Store covered in refrigerator.